"This painting is a segment of fishing in and on Penobscot Bay and covers the period from 1898-1902. I chose Eagle Island due to my personal knowledge of this Island and my friendship with Erland Quinn wo was born on the Island (4th generation). The setting is off the Northwest corner of the Island. This point forms what was known as Northwest Cove or Government Cove as the lighthouse keepers kept their boats in this cove, except for a hard northwest breeze. Eagle Island lies west of Sylvester's Cove, Deer Isle. 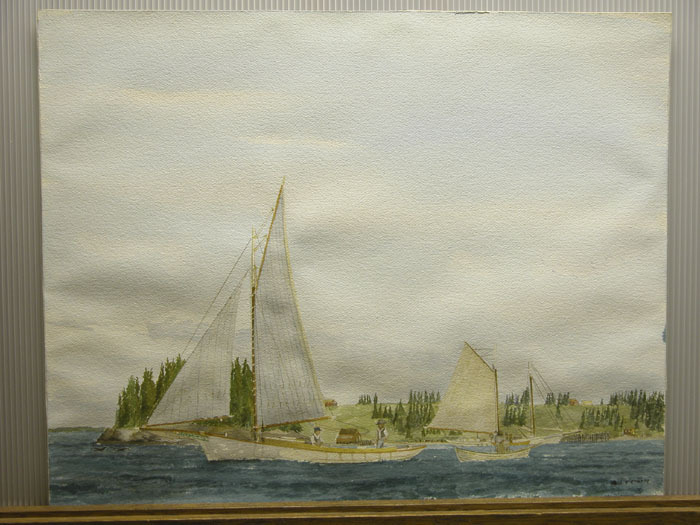 The Maine sloop boat belonged to Howard Gray. He was from Bucks Harbor on the mainland and fished summers through the dates listed. His wife was a Howard whose ancestral home is on the ridge directly above the herring weir. The sardine schooner is the well known Continental. She is loading herring from a dory that came out of the pocket of the weir. The peapod was one of the many boats built on Eagle Island. She is an early Quinn model with quite a full bow, and the man hauling traps is Arvid Howard. Directly over the fish barrel in the sloop is the Quinn fish house. The short wharf was extended during 1907 and 1908 so boats could get into the wharf at low water. From the pond, which is directly above the schooner's transom, the Quinns and the Howards and their sons-in-law cut ice in the wintertime for their own consumption and also for the summer people who were boarders. Eventually these boarders had their own cottages and pleasure boats built by island people."